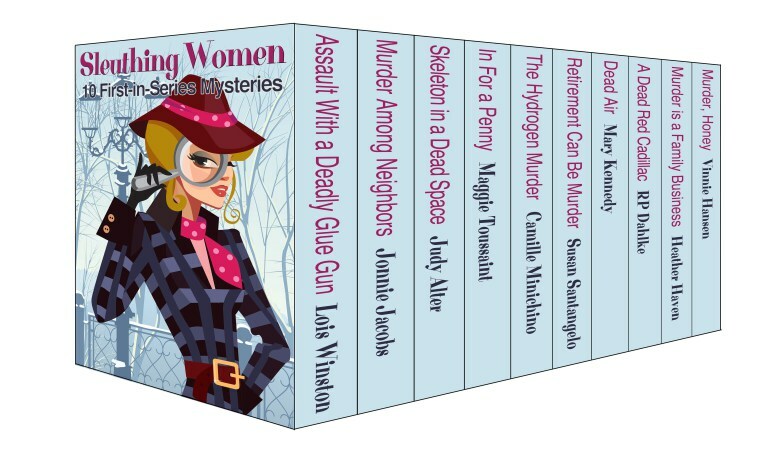 Sleuthing Women is a collection of 10 full-length mysteries featuring murder and assorted mayhem by 10 critically acclaimed, award-winning, and bestselling authors. Each novel in this set is the first book in an established multi-book series—a total of over 3,000 pages of reading pleasure for lovers of amateur sleuth, caper, and cozy mysteries. RETIREMENT CAN BE MURDER—A Baby Boomer Mystery by Susan Santangelo—Carol Andrews dreads her husband Jim’s upcoming retirement more than a root canal without Novocain. She can’t imagine anything worse than having an at-home husband with time on his hands and nothing to fill it—until Jim is suspected of murdering his retirement coach. That Anastasia Pollack gets out alive with her sanity intact in "Assault with a Deadly Glue Gun" is a testament to the resiliency of women and the writing of Lois Winston. Jonnie Jacobs does a great job in "Murder Among Neighbors" with Kate Austen's angst at having an absentee husband, the murder of her next-door neighbor, and the handsome detective in charge. .To set a novel in a place with which a reader is familiar can be dicey. I lived in Ft. Worth for 8 years (and had two of my children there). Judy Alter 'nails' (small renovation pun there) Ft. Worth in "Skeleten in a Dead Space". Judy also made Kelly O'Connell's troubles with her ex-husband very believable. Again, speaking from experience. I was a bit worried in "Retirement Can Be Murder" that Carol and Jim would be heading for a divorce regardless of whether or not Jim retired soon or not. But then, Jim is accused of murder and the Andrews family closes ranks and tackles the problem en masse. Carol and Jim can't seem to agree on anything and argue frequently. But that makes them human (if volatile). Susan Santangelo gives us a 'first couple' who have their flaws, but we pull for them anyway because they are so well conceived. It all goes on in Lalla Bains' neck of the woods in "Dead Red Cadillac". RP Dahlke shows us that lots of things can happen anywhere, not just in 'those' neighborhoods. And Lalla has two men in her life, one a sheriff who may be more than a best friend, but separated from his wife; the other is nephew of the victim and definitely not what he shows himself to be. A fine tension in this whodunit. In "Murder is a Family Business" Liliana 'Lee' Alvarez is a PI working for the family agency. Even though she has a fondness for designer clothing, her street smarts are not always equal to the task. I mean, who wears designer clothes on a stakeout at Fisherman's Wharf? Despite that, Heather Haven gives us a well-rounded heroine who often speaks two languages at a time, given she is half-Latina, half-WASP (her words). I love that. Carol Sabala is a baker in a restaurant in "Murder, Honey" by Vinnie Hansen. The head chef falls face first into Carol's cookie dough, having been murdered. The author cooked up (yeah, I know) a striking victim-villain; he must have been something awful 'in real life' to have so many people mad at him. He was the kind of person who got "I could just kill you" verbally thrown at him on more than one occasion. Don't miss this anthology. The price is good, the writing great! LINKS TO THE AUTHORS' WEBSITES! Click the banner to go to the tour site where you will find links to more reviews, as well as guest posts, character guest posts and an interview with one of the authors! You can also find out how to become a blog host for future book tours! Thanks for your review! We love it! Thanks for writing such a great book, and for allowing it to be included in this anthology! A great collection of books from great authors. Can't wait to read. Sounds like an amazing collection. Such a detailed review of the short stories here! I love reading anthologies because I love seeing how stories can share a theme that connects them all but can still be pretty unique from one another.